As someone who is as knowledgeable about Ohio’s accountability measures for gifted students as anyone, I was simultaneously proud and frustrated while reading the Fordham Foundation’s latest report, High Stakes for High Achievers. To be clear, I am grateful to have been part of the discussions and policy development leading to some groundbreaking new accountability measures for gifted students in the state of Ohio. The Ohio Association for Gifted Children has worked on moving the state toward breaking out gifted performance since 2009. In fact, Ohio’s gifted performance indicator is one of very few elements of the Strickland administration’s education overhaul that survived the Kasich administration’s education overhaul. (I can’t wait until the next governor’s education overhaul…) And, in the absence of a mandate for gifted services, it is, frankly, better than what we had before for gifted students, which was nothing. But as soon as the Fordham report dropped, a parent on an Ohio gifted forum asked, “Apparently, Fordham Institute thinks that Ohio is the best. Should I feel sorry for the other states?” It is easy to understand the frustration of this parent. After all, even as Ohio earns three stars from Fordham in the report, the vast majority of gifted students in Ohio remain unserved. Even worse, if you are a minority or economically disadvantaged gifted student, you are less likely to be served than your non-minority or non-economically disadvantaged peers and much less likely to even be identified. (Please see the State of Gifted in Ohio report for more details.) So how do we account for Fordham’s enthusiasm for what Ohio is doing, and the ugly reality of what is not happening for gifted students in Ohio? And, more importantly, how do move the needle for these students in a state that is increasingly moving toward fewer regulations? What Fordham Sees and What it Misses: Like so many think tank reports, Fordham’s take on high achieving accountability is a snapshot taken from a 30,000 foot view. The focus of the report is solely on output measures that apply to all students and neglects any other gifted education policy at the individual state level. It is terrific that Ohio has incorporated several measures on district report cards designed to support gifted students. But the reality is that districts are still not mandated to serve gifted students, and the vast majority of districts do not. This is not accounted for in the Fordham report. The exclusion of such things as service mandates, appropriately trained gifted instructors, and other valuable inputs is a problem. The other glaring issue is really the question of what happens if districts fail to measure up on the gifted performance standards. In Ohio, the answer is clear: not a darn thing. Accountability without repercussion for lack of progress typically means little change at the local level. What we have found in Ohio is that wealthier, suburban districts along with some of the major urban districts have responded to the gifted performance indicator, while smaller, rural, and poorer districts have done little. In fact, as a typology group, gifted students in the poorest rural districts have actually done worse each year in terms of value-added growth. Another issue with Ohio’s accountability system for gifted students is the shortfall of the measuring stick: state assessments. Without the ability to measure above-grade level achievement and growth, it is difficult to know how well Ohio’s gifted students are truly doing. These assessments still largely only measure math and reading achievement in limited grade bands. Also, while there are gifted measures on the district report card, they represent a very small part of how a district is measured. For many districts, it is often easier to ignore the population than address the problem. What Should We Do to Improve the System? Going into the third year of the gifted performance indicator and gifted value-added sub-group measure, there are some changes that definitely would help to match Fordham’s three-star rating of Ohio’s gifted report card measures with the typical experience in Ohio’s classrooms for a gifted child. While, there are lists of changes that are needed, here are the big game changers: First, gifted services in Ohio’s districts should not be optional. Every student should be able to learn and grow in Ohio’s classrooms. Second, the Ohio State Board of Education should pass gifted operating standards that are rigorous, especially with regard to what constitutes true gifted services and appropriately trained gifted staff. Third, the gifted performance indicator, when revised, should have increased emphasis on properly identifying and providing services to the most vulnerable of our gifted students in Ohio. Fourth, Ohio should move to adaptive state assessments as soon as it is feasible. And finally, Ohio gifted students need to have alternatives if they reside in districts that do not provide adequate opportunities for their gifted students year after year after year. There needs to be some repercussions for districts chronically failing this population. Please don’t get me wrong. I am very appreciative of Fordham’s latest report. Since the days of No Child Left Behind, state accountability systems across the country have done little to push districts to support the needs of gifted students. This report shines a big, bright light on this issue. But I would hate for any Ohio policymaker to think Ohio’s three stars in this report mean that Ohio is doing a good job in educating gifted students. The bottom line is that it is a good start for Ohio to have accountability measures for gifted students on the report card. But the measures are iffy at best as they are still all grade level, they fail to account for adequate services provided to gifted students (a.k.a. input measures), and there is little consequence if districts don’t measure up. So, congratulations to Ohio for being a leader. Now let’s get to work to actually make Ohio a better place for a gifted student to learn. Last week, the Fordham Foundation held an event in Columbus introducing their new report, “Getting Out of the Way: Education Flexibility to Boost Innovation and Improvement in Ohio.” The gist of the report is simple: the state should modify or eliminate laws and rules that tie the hands of districts leaders trying to innovate and manage operations. Specific areas ripe for de-regulation include staffing ratios, licensing requirements, allocating district resources (i.e. funding), minutes of instruction, and scheduling. This should all sound all too familiar to gifted advocates who have previously fought against the proposed elimination all standards of quality around gifted instruction and staffing in the gifted operating standards. At the Fordham event, the key author of the report, Paulo DeMaria, covered the key points of the report and then a panel of experts (Tom Ash of BASA, Mark Schare, Worthington Schools Board of Education member, Steve Dackin, former superintendent of Reynoldsburg, and C. Todd Jones, State Board of Education member) answered a few questions regarding de-regulation. The questions and answers were all fairly predictable: panel members thought there were too many regulations; local districts should have more control etc. etc. At one point during the discussion, however, Mr. DeMaria made two interesting statements that I think should be explored a bit more deeply. His first statement roughly paraphrased was, “If you want a different outcome, you need to pursue different strategies.” Fair enough. He also asked the question, “How do we know that districts and schools will do the right thing?” His answer was that we just have to trust that they will. To challenge these statements, perhaps it would be instructive to see what has happened to gifted education over the past few years so we can decide if the path we are now on is working. We can also determine whether the trust that we have placed in the hands of districts has resulted in the right thing for gifted students. After all, as gifted services in Ohio are offered at the discretion of each district, gifted education is truly the most de-regulated area of education in Ohio. Funding has been de-coupled from staffing over the past six years. Services, once tied to specifically licensed gifted personnel are now much looser. Many districts are now counting gifted students in general education classrooms as served even if the classroom teacher has no background in gifted education and no additional support is offered to the students. So what are the results of all this de-coupling, de-licensing, and de-regulating? Identification of gifted students has decreased by 8.5% since 2008. Services have plummeted to 23% of the gifted population. For reference, in 2000, the service rate was 41%. Licensed gifted staff levels have decreased by almost 25% since 2008. Over half of all districts in 2014 reported that they used some or all gifted formula funding for purposes other than to identify and serve gifted students. Only one-quarter of Ohio’s districts met the new gifted performance indicator in 2014, the elements of which are currently set at a very low threshold. By getting out of the way of districts, the state has actually limited opportunities for gifted students. Sadly, the most vulnerable of these gifted students, those who are economically disadvantaged are the least likely to receive an appropriate education. They are less than half as likely to be identified and only 81% as likely to receive gifted services as non-economically disadvantaged students. (Source: 2015 State of Gifted Education in Ohio). In fact, a national report on the excellence gap on high-ability students took Ohio to task for the appalling gap in performance between economically-disadvantaged high-ability students and those who were not. Ohio’s gifted students will never receive the educational opportunities they so desperately need if state policymakers continue to “get out of the way” of districts. When the State Board of Education of Ohio takes up the gifted operating standard discussion again, members should heed the advice of Mr. DeMaria. If we want different outcomes, we need to choose different strategies. We need to strengthen accountability of gifted services, gifted identification, gifted funding, and gifted staffing. We need to ensure that services are truly services, that people making decisions about gifted students at the district level actually have expertise on this student population, and that all gifted students in Ohio have access to opportunities commensurate with their educational need. Getting out of the way has clearly been a disastrous policy for Ohio’s gifted children. It is time to do something different so we can achieve a better outcome for these students. The Jack Kent Cooke Foundation recently released a report entitled, “Equal Talents, Unequal Opportunities: A Report Card on State Support for Academically Talented Low-Income Students.” One of the reasons this report is ground-breaking is that the authors assign grades to each state on two sets of indicators: Inputs and Student Outcomes. Gifted advocates in Ohio should be quite familiar with these terms. There was deep debate about whether inputs or outputs should be used a basis for the gifted performance indicator. The answer in Ohio (and now it appears on the national level) is that both inputs and outputs are necessary to look at the overall health of state support of high-ability students. 1. Make high-performing students highly visible – In other words, make sure the support and performance of these students are transparent to the public. 2. Remove barriers that prevent high-ability students from moving through coursework at a pace that matches their achievement level. 3. Ensure that all high-ability students have access to advanced educational services. 4. Hold LEAs (districts) accountable for the performance of high-ability students from all economic backgrounds. Each of the two grades in the report is based on nine indicators culled from a list of over forty (Figure 2 of the report). Most of the indicators are based on general policies that would (naturally) support gifted students. The full list of indicators is worth reviewing as many that I personally think are the most important (including all indicators relating to actual opportunities for student participation in advanced learning) were somewhat conspicuously not incorporated into the grading system. This is apparently due to both to the lack and validity of data related to advanced learners in many, if not most, states in the country. Unfortunately, one of the most important indicators (incentives or penalties tied to advanced performance), was not included in the list of indicators chosen for the state input grade. But enough quibbling about indicators. Let’s get to the real question: How did Ohio perform in this first-ever report of state support for academically talented low-income students? * It is unclear to me what the authors of the report were looking for in terms of monitoring or auditing districts. 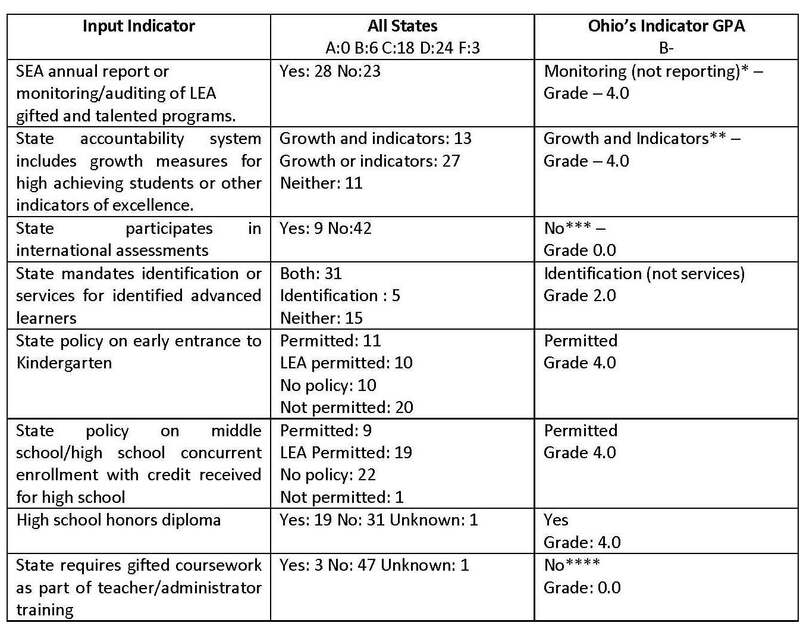 Ohio does actual track data on districts, requires a self-report, (somewhat) audits districts, and reports a good deal of this information on the gifted dashboard. Perhaps as the dashboard came into existence after this report was released, it was not included. ** While the report praises Ohio for the gifted performance indicator, the authors criticize the indicator as not having a factor to explore the excellence gap between low and non-low income students. The 2014 Ohio gifted performance indicator actually does look at both at the identification and services of low and non-low income students as well as minority and non-minority populations. The report is using Ohio’s pre-2014 indicator which has fewer components. Ohio still does not report performance of gifted low-income vs. non low-income students, which is possibly something for future consideration. *** Ohio and most, if not all, other states do participate in international exams. What the authors of the report don’t explicitly explain is that some selected states are used as benchmark states in some of PISA and TIMSS. In order to be a benchmark state, the state has to be chosen by the USDOE Center for Educational Statistics. Ohio is not one of these chosen states. Also, a few states pay extra to be counted and reported separately in PISA or TIMSS. Given that benchmarking participation is not necessarily in the control of each state, I’m unclear why this indicator was selected as one of the nine. **** Ohio Revised Code actually does require teachers to have rudimentary knowledge of gifted students in all pre-service programs. (Administrators were required to as well until 2009 when the language was taken out of ORC). Unfortunately, the Ohio Department of Education and the Ohio Board of Regents never enforced this part of the law. Consequently, very few teacher preparation programs include gifted education standards. The Ohio Association for Gifted Children (OAGC) has been the major organization advocating for the gifted identification law, early entrance to kindergarten, dual middle/high school grades, the state acceleration policy, gifted pre-service for all educators, gifted value-added, the gifted dashboard, and finally the gifted performance indicator. Ohio fares well on the input grade because gifted advocates have pushed hard for transparency and some measure of accountability for gifted students in this state. We should all be proud of these efforts. It should also be validating that some of our work is used as an example for other states (e.g. the gifted performance indicator). And once we’ve patted ourselves on the back, let’s take deep breath and view the not so positive news: the output grade. * Up to four points are assigned to each of the first five indicators based on the percentage of students scoring at advanced levels. **Points for each of the last four indicators were based on the relative performance of low-income students to not low income students scoring at advanced levels. A maximum of four points was awarded for each indicator. In fact, it is apparent from the 2015 State of Gifted Education in Ohio report that students in poorer districts overall are less likely to be identified as gifted, less likely to be provided with gifted services, less likely to have appropriately licensed gifted staff, less likely to have state funds allocated for gifted education actually spent on gifted services, and less likely to meet the gifted performance indicator. The Bottom Line – Largely due to the pressure from gifted advocates with the support of a few incredibly supportive policymakers along the way, Ohio does well in removing barriers from learning and showing the public how gifted students are supported (or not) in Ohio. But aside from a few more important changes to funding accountability and service and staffing transparency, these efforts will soon reach a limit. Policy makers now need to take the lead to make the change that will lead to real progress by requiring gifted students to be served in all districts. Until this is accomplished, high-ability low-income students, particularly those in lower wealth districts, will never come close to receiving the same opportunities as those students whose parents can either provide the opportunities privately or can move to districts that choose to provide those services. It is quite simply an issue of educational equity. A few weeks ago, I wrote about a growing backlash against the value-added gifted sub-group data. (“Superintendents to Parents: Who Are You Going to Believe, Me or Your Lying Data?”) This week, I would like to do a short-follow up. There are superintendents and others who would prefer to convince parents that they should disregard poor value-added scores for the gifted sub-group. But there are also superintendents who are taking note of the poor scores and responding in a way that is much more positive. More importantly, there are a growing number of parents who are insisting that something must be change for gifted children in their districts. Within the last week, at least two parent groups have reached out to the Ohio Association for Gifted Children (OAGC) to get help in organizing or re-organizing parent affiliate groups. For those parents who are interested, the OAGC Parent Division will be hosting a meeting on Saturday, November 2, 2013. Please contact OAGC Parent Division Chair, Angela Grimm, at aecrowder@yahoo.com for more details. In addition, I have heard from a few districts that are now forming study groups to determine how best to “fix” gifted within their districts. Most of these districts have greatly reduced gifted services over the past five years as a result of uncertain funding and non-existent state oversight. In the urban areas, there seems to be a reawakening in several city districts, that can establish gifted community schools. One such school (an open enrollment school) has opened up in Sandusky this year, and several other urban districts are also making plans to open up gifted schools. Finally, I am encouraged that several superintendents have stepped up to support OAGC’s position that before all regulations or “inputs” are eliminated from the gifted operating standards (currently under review by the State Board of Education), that the state needs to develop a better set of “outputs.” In addition, these superintendents believe it is reasonable that gifted funds be spent on gifted children in their districts. My thanks to these superintendents and others who are not shying away from their responsibility to gifted students within their districts. For those who are not so responsible, we will need to rely on parents and policy makers to push hard against the movement to undercut accountability measures for gifted students in Ohio. To keep up with current information on the gifted operating standard process, please visit www.oagc.com/?q=advocacyalert . Superintendents to Parents: Who Are You Going to Believe, Me or Your Lying Data? At this week’s state board meeting achievement committee meeting in Ohio, we were treated to a rare appearance of the state superintendent. He shared how important the gifted value-added output has been and how so much “pro-active engagement” was now taking place to improve services for gifted students because of just this one little measure. His effusive praise was to support the gutting of all inputs in the Ohio gifted operating standards. As for those districts who are skirting the law or who are trying to game the system, well, that’s a concern that ODE will have to address. Of course, when that would be addressed is anyone’s guess. I assume it will be after all the quality gifted input standards are removed and gifted services are more illusory than real. In Dayton, where last year, one GIS was in place for a district with almost 14,000 students, the district superintendent responded in s similar manner with regard to the “D” grade on the gifted value-added subgroup. “I think everybody was kind of looking at gifted and scratching their heads. If you’re going to report on achievement of a group, and the law says you identify only, literally, then we’ve got to step back. We have economically disadvantaged students, we have special needs students, we have gifted students. How do you establish your resources to meet the needs of those very different groups. If you ask the majority of our parents, they’re going to say all of our children are gifted.” Even though the state has provided a record amount of gifted resources to Dayton in this biennial budget, the superintendent has decided that the GIS will now be the gifted coordinator, and all services will now be in the regular classroom (i.e. non-existent). In other words, the pro-active engagement was to eliminate all gifted services. In a district that shall remain anonymous, the superintendent under fire for the “F” value-added growth measure asked his coordinator if perhaps fewer children could be identified by increasing the criteria so that the district’s ranking could improve. That would be illegal. But once the gifted coordinator is replaced by the janitor, which would be allowed under the draft gifted operating standards, I’m sure “fixing” the identification at this district will be no problem. Another anonymous district decided that the way to deal with the low gifted value-added subgroup wasn’t to do a deep dive into the data to see how to improve services. No, their response was to tell all of their gifted staff that they were going to be RIFed at the end of the year. Pro-active engagement, not so much. While I welcome the development of higher-quality outputs, I know that there are always going to be superintendents who rather than do the right thing, are going to try to either explain the data away to the public or manipulate the way the district looks by suppressing identification or manipulating service statistics based on a service model that is basically no service at all. Outputs alone are insufficient accountability measures for any student population. For the gifted subgroup, they are particularly inappropriate as output measures are usually inadequate for this population. This past week, Ohioans heard a similar theme expressed by the State Board of Education Achievement Committee Chair, the State Superintendent, and the education bureaucracy groups: The state should get out of the business of dictating how districts spend state funds. The state should simply send funds to the districts, step back, and let districts do their “good” work. The state should step away from micro-managing superintendents who know best how to educate children. Sounds reasonable, doesn’t it? But what happens when superintendents and treasurers (who increasingly seem to be calling the shots in districts) don’t know what they are doing with certain student subgroups? Or worse, what happens if they don’t have any problem reallocating funds for that subgroup for any other purpose with impunity? Unfortunately, this is just what we have experienced in the last four or five years with gifted children in Ohio. Without any protection from the state; without proper monitoring; and without any accountability, gifted children have not fared well under the free-for-fall all funding system. Since 2009, the gifted funding mechanism could not have been more flexible. It has been as bendable as Gumby. While adults in the education system at both the state and local levels have enjoyed spending gifted funds as they see fit, the impact on gifted children, by any measure, has been severe. While I can quote service declines (by over 30%) and gifted staff losses (by over 16%), for now, I’d like to focus exclusively on what has happened to gifted funding when districts were given maximum flexibility. Prior to 2009, districts received state funds for gifted identification and were required to account for the spending of those funds. They also received, upon request, limited funds that would support gifted coordinators and gifted intervention specialists. Those funds could not be used for anything else. From 2009 to the current budget year, districts that previously had received gifted unit funding and identification funding were allowed to spend those funds for unspecified gifted services under a maintenance of effort provision. Rather than actually spending gifted funding on gifted students, a good amount of this funding was diverted to other functions. The most common ways to divert the funds was simply to implement a work-around sanctioned by the Ohio Department of Education. Funds previously spent of gifted professionals were now allowed to be spent on classroom teachers who had gifted students in their classroom. Each gifted student was provided a written education plan (WEP), but the classroom teachers, in many districts, had no background in gifted, no training, and provided no differentiation. It is a form of service I like to call “lip service.” This is apparently very common practice across Ohio, and it continues today. As one former gifted professional stated, “[D]istricts are claiming service due to the fact that the kids are cluster grouped in regular classrooms and the teachers then differentiate for them…..WRONG! With all the pressure to get the bottom kids through the test – the gifted kids are getting nothing. They are being served on paper only.” What is even more disturbing is that districts are supported by ODE in this deceptive practice. “[T]here is a spreadsheet that ODE has you use that figures out the percentage of students in a class that are identified times the percentage of the instructional day for the teacher times their salary to arrive at a dollar figure for each teacher who has a cluster.” I wonder where the sheet is that shows that classroom teachers are differentiating, getting training, or have support from gifted staff? For the record, research shows that differentiation in the general education classroom for gifted students takes place only sporadically even when training is provided. Another way to skirt the maintenance of effort was to “shift” funding to Advanced Placement training for teachers in AP classes that are open to all students and may or may not have any gifted students in the classroom. Or they just wrote up a quick WEP for gifted student in AP class and diverted the funds to that teacher. This is a very common practice as indicated by this comment from an anonymous gifted professional whose dealings with ODE were less than ideal in terms of encouraging districts to meet the intent of the maintenance of effort law, “I was hoping they would suggest that the district return to the 3 full (gifted) positions…. Instead they provided suggestions on how the district could get around that by having me write WEPs for high school students in AP classes if in the area of identification or have me write WEPs for students taking PSEO classes in the area of identification.” It is a great out for the district treasurers and superintendents who gutted gifted elementary services and wanted to pretend they were still using the funds appropriately. But for the 120 or students in the elementary school who were to be supported by the gifted maintenance of effort funds, it represents a complete failure of leadership and fiduciary responsibility on the part of both district and state-wide education officials. While technically legal, it was not the intent of the law to merely provide the illusion of the same level of service when in fact services to elementary students were cut across the state. 1. EMIS coordination – Rationale: Some students are gifted; therefore any data entry should count as some data entry was for students who were gifted. 2. General Office Supplies – Rationale: Some of the supplies could potentially be used on gifted students. 3. Grant coordinators – Rationale: Some of those funds generated from grants might be used in classrooms where there are gifted students. 4. Filing cabinets – Rationale: Some files held information on students who were gifted. 5. Gifted testing – This is usually legitimate, but gifted funds were also supposedly spent in districts where there was no evidence of gifted identification. A review of an ODE audit showed a district with EMIS records where 0 students were screened, assessed or identified in any category or grade level. Despite the clear neglect of the identification law, ODE did not propose any audit findings. ODE staff indicated the district was in compliance because they had a gifted identification plan on file, and ODE takes it on faith that is implemented even when presented with evidence that it is not. 7. Video Cameras for Visual Performing Arts (VPA) identification – even though the district does not identify any students in VPA and doesn’t have a process for doing so. 8. New computer for the superintendent. The gifted coordinator was given the superintendent’s old computer, which subsequently crashed losing all gifted student data in the process…. 9. Regular classroom teacher on leave of absence who happened to have a gifted license. The teacher was fired before returning to the classroom. 10. Gifted coordination services from a gifted coordinator who was deceased. The result of giving districts gifted funding to districts with almost no strings has been an unmitigated disaster for gifted children. The less than stellar results of the gifted value-added subgroup substantiate the fact that free-for-all funding is poor public policy. State Board of Education members should fulfill their constitutional role to ensure that the state system of public education extends to all children including those who are gifted. The new draft operating standards as currently written will only exacerbate the problems we have already seen with flexible gifted spending at the district level. The new standards will make the problem worse as the definition of service will become so meaningless that anything will count. This will give districts a PR boost for perpetuating the fantasy that they are doing something more for gifted students when in fact they are doing nothing at all. ODE is taking comments on the new gifted operating standards through the end of business on September 20th. Write ODE at gifted@education.ohio.gov and tell them you want spending and service accountability and true standards for the identification and service of gifted children. Specifically, tell them to reinstate minimum contact service time, staff ratios, and staff qualifications. For more information about the new draft standards, please go to www.oagc.com/?q=advocacyalert . Of late, for whatever reason, several political pundits have focused on Ronald Reagan’s famous gaffe at the 1988 convention in New Orleans. While attempting to offer the John Adams aphorism “Facts are stubborn things,” Reagan twisted the quote a bit and turned it into “Facts are stupid things.” If you are old enough to remember the incident, you will recall that Reagan was widely ridiculed for the goof-up. I’ve been giving both of these quotes a good deal of thought lately. I think, actually, that Reagan may have been on to something. Facts can indeed be very stupid things. Facts, in and of themselves, are just pieces of data. Without perspective and analysis, facts can be manipulated this way and that to tell whatever story the storyteller wishes to tell. Unfortunately, once the story is told, it is almost impossible to provide a different, more correct interpretation of the facts embedded within that narrative. This is the case, I believe, in a recent report sponsored by the Ohio Business Roundtable, the Ohio Department of Education, and the Ohio State University. The report is titled Failure Is Not an Option: How Principals, Teachers, Parents, and Students in High-Achieving, High-Poverty Schools Explain Their Success, and it highlights nine schools for their achievements. The three elementary, two middle, and four high schools were selected as Ohio Schools of Promise for 2010 and 2011 or were close to the selection cutoff. The criteria for selection as an Ohio School of Promise criteria are performance on the measures of AYP and the Ohio Achievement Assessments or the Ohio Graduation Test. High school graduation rates are also considered for high schools, as is value-added growth for elementary and middle schools. So far, the facts are clear-cut: each school met or almost met the Ohio Schools of Promise criteria for one or more years. With the exception of graduation rates, however, almost all of the criteria relate back to Ohio’s state assessments—and this is where the facts are both clear and blurred at the same time. By the ODE’s own admission, Ohio’s state assessments are not high quality. Moreover, cut scores to make the grade are abysmally low. While it still may be remarkable that these schools perform as well as they do, it is not at all clear that the students are performing as well as the report’s authors would have us believe. To demonstrate, let’s focus on the facts shared about one of the four high schools. No value-added data are reported for the high schools, so it is almost impossible to determine what kind of achievement growth is taking place in each school. In the 2009–2010 school year, School A met 12 out of 12 standards on the Ohio report card and received an excellent rating. More than 98% of their 11th-graders were proficient or above in reading, math, and social studies. Approximately 94% were proficient or above in science, and more than 87% of 11th-graders were proficient or above in writing. Those are the facts, and most parents would be happy to send their children to this school on the basis of those facts. But without proper context, these facts are stupid things. Here are some other facts, which provide a more complete story. While most of these students, many of whom live in poverty, are passing the Ohio Graduation Test (OGT) and graduating, it is highly unlikely that they are college or career ready. To understand why this is so, one must dig into the data. First, let’s go to the cut scores on the current OGT. The proficiency cut score is extremely low—43% for both reading and math. We already know that the new assessments coming out for the 2014–2015 school year to support the Common Core Curriculum will be much more difficult. ODE staff members have indicated that unless students are passing at accelerated or advanced rates on the current OGT, they will be unlikely to score at the proficient level on the new assessments. In the 2009–2010 school year, no students in the 10th or 11th grade in School A scored at the advanced level. In the 12th grade, 10% scored at the advanced level, but no students in 12th grade scored at the accelerated level. Twelve percent of School A’s 10th-graders scored at the accelerated level, and 5% of the 11th-graders scored at the proficient level. This means that the vast majority of students will not meet levels of proficiency by 2014–2015. (Note: While it would have been interesting to see how gifted students performed on the OGT, School A does not report any students as identified as gifted.) Other facts also call into question just how promising the future is for School A’s graduates. No student at School A received an honors diploma. No student passed an AP test with a score of 3 or above. The average ACT score was 14 (the state average is 22). And the facts on how graduates fared in college are very telling. First, only 11% of School A’s graduates went on to a public college in Ohio. Of those who attended postsecondary institutions, 44% went to a community college. Sadly, 94% of School A’s graduates who did attend a public university or community college required remediation in English or math. While the faculty of School A are presumably doing exactly what has been asked of them by the state of Ohio, it is apparent that their students are graduating with much less promise than advertised. Failure may not be an option, but the low bar for success is doing a disservice to students, parents, and policy makers. Unless all of the data are revealed, the public gets only a version of the truth. A story built on partial facts can lead us to think and do stupid things. That is the danger of stupid, stubborn facts.